It’s always funny when a car you think is nearly extinct shows up in multiple listings (although – when’s the last time you saw a Honeybee version?). Succeeding the B110 Sunny, or Datsun 1200 as it was known in North America, the B210 was a rebodied B110 platform with a 1.4-liter A14 engine, sold for $2849. That sounds cheap now, but on an inflation adjusted basis, it’s over $12,000 – think of what you can pick up for $12K now. It may not be the best car in the world, but it probably has cloth seats, a stereo with at least 4 speakers, and air-conditioning, never mind all the new safety features. But who wants all that crap weighing your car down? The B210 weighed in around 2000 lbs., and for some reason they have an exceptionally high survival rate in the Los Angeles area. 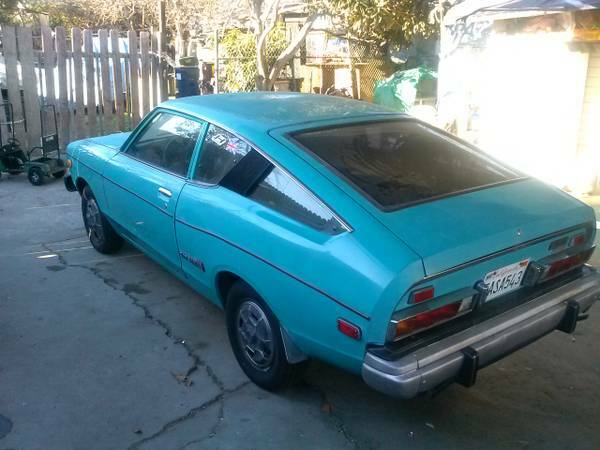 Our first 1975 Datsun B210 hatchback is available for sale for $3000, straight outta Compton (sorry). While it’s the most expensive of our trio, it also appears to be in the best condition. The color is unusual, but appealing, and barring a couple of missing trim pieces and a hubcap, it’s largely complete. As it (and the two others) is a 1975 model year car, it will need no smog testing, which means it’s time for a little fun beneath this homely shell. Speaking of the exterior design, it’s by no means attractive, but definitely interesting in a period where Datsun was trying out some unusual, futuristic looks. Manual transmission means you’re going to be able to squeeze every ounce of power out of the little engine, which generates 70hp. In some markets, there was a GX model with dual carburetors. In any case, with this engine being produced as late as 2008 according to some sources, you should be able to take advantage of more recent versions’ upgrades for your own benefit. 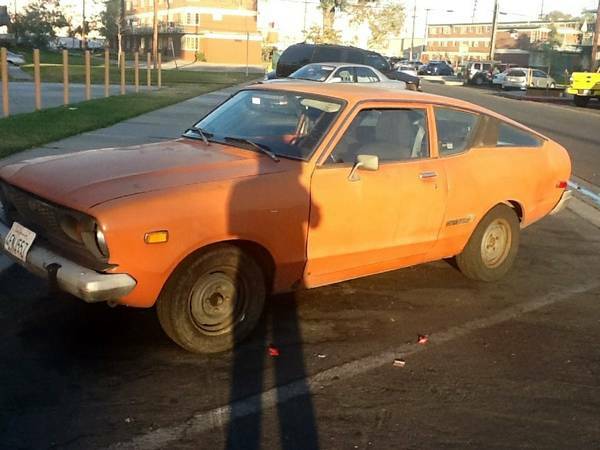 Orange, as seen on this 1975 Datsun B210 found in downtown Los Angeles, CA for $1500, was a much more common color at the time. This particular car looks a little rough, but perhaps a little elbow grease will bring the paint back from the dead. Interestingly, it has a slimmer front bumper than the car seen above. How about a flat black hood, some Panasport wheels and knobby tires, and a slight lift, together with some rally stickers and a CB radio with whip antenna? The owner says it’s “ready to go anywhere”, neglecting to include the second half of that phrase, “as long as it’s out of my sight”. 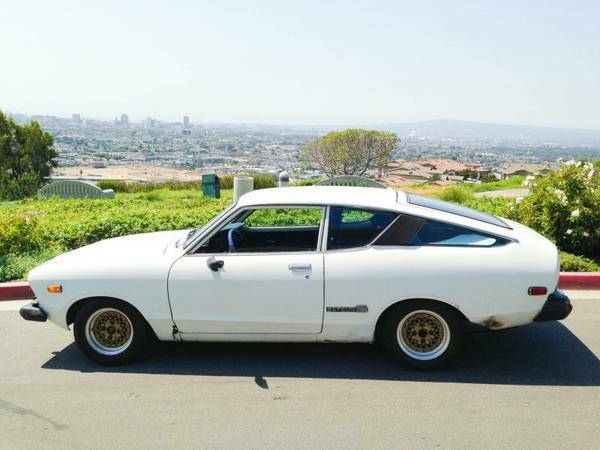 The last one is this 1975 Datsun B210 in white, offered in Long Beach, CA for $3100. The seller of this car has already shown some insight insanity, adding early 1980s Enkei wheels, coilover suspension, and a Weber carburetor to extract some performance out of the little A14. The car is still rough around the edges, but looks like it has the most potential to be fun. Your best option is probably to use this as inspiration for modifying the straightest one of them all, the first example featured above. Do you have experience modifying one of these? Post in the comments below. This entry was posted on October 25, 2013 at 9:56 am and is filed under Feature. You can follow any responses to this entry through the RSS 2.0 feed. You can leave a response, or trackback from your own site. TheHoneybee was Datsun’s answer to the fuel crisis in the early ’70’s,very stripped down,bare bones,etc.Most of them dissolved here in Massachusetts in a very short while….. The Datsun dealer was a couple blocks from my house when I was a kid, we used to skateboard down the showroom floor ramps when they were closed and I remember the window sticker price was under $3K for the HoneyBee but the dealer added a bunch of extras like scotch guard, rust proofing, decals and whatever else they could gouge customers for on every car, they even charged $50 or so for de-cosmolining (I didn’t know what that meant at the time but later learned that cosmoline is the coating the manufactures put on the trim to keep it clean during shipping and it wipes right off). $50 was a nice bit of money in 1977. I sell cars now but it still shake my head at the dubiousness of that.